Cable Location Services in Brisbane, Sunshine Coast, Gold Coast, Gladstone, Sydney, Wollongong, Melbourne and Adelaide regions. What does the use of underground utility locating equipment involve? At VAC Group, we've been providing underground cable testing to clients in areas such as Adelaide and Melbourne since 2000. Using high-tech pipeline locator equipment and the latest technologies, we assess the ground you want to work on for hidden cables – making the invisible, visible. Our buried cable locator service starts with a scan of your work area. During this process, we'll use underground utility locating equipment for the job. 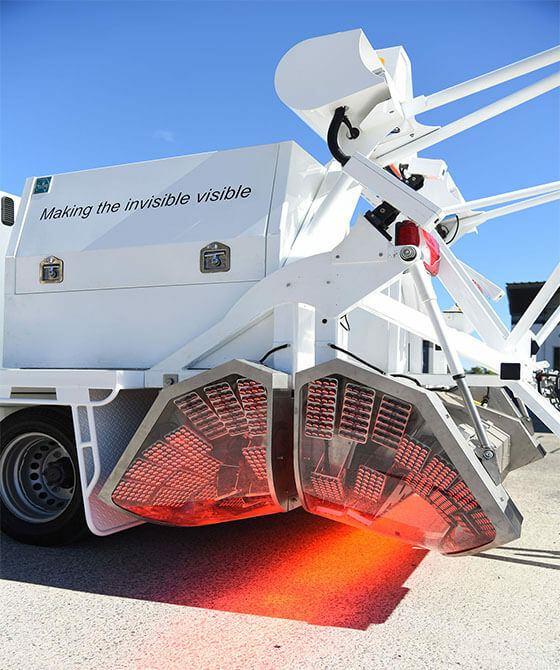 At VAC Group, we have Australia's only 3D radar scanner that's suitable for such purposes. This means we secure a high degree of accuracy with each scan. While we carry out our cable location services, each team member uses the latest working practices. Once the job is done, we'll provide you with a detailed report, which you can then use to shape the rest of your project. An impressive range of pipe locators and other machines at your disposal. Safety, accuracy, and your job's success is our top priority. From pipeline locator equipment to the most advanced scanning machines available, using our services, Australia wide, means you're benefiting from a service that's second-to-none. With a team of more than 150 trained staff and meticulously serviced machines, we're also efficient. Why choose VAC Group for your cable location services? With GPR technicians who are highly proficient at detecting underground utilities, we guarantee we can deliver an excellent service to each of our customers. To find out how we can help you, call us on 1300 822 834. During your construction efforts, minimising damage to underground pipes and cables should be a priority. At VAC Group, we work with clients throughout areas such as Brisbane and Sydney using our buried cable locator service. With five of our very own electronic detection crews, we're able to provide cable location services that achieve a high degree of accuracy. Using the skills of our dedicated workforce, you can avoid the expenses that come with accidentally damaging cables during your construction efforts. Why would you need to use a cable locator in Brisbane and the surrounding areas? Every time you break ground, there's a risk that you'll damage cables. Going in blind is risky business but you can avoid these risks when you use our cable locator services across Brisbane, Sydney, Melbourne and Adelaide regions. Due to increased urbanisation throughout Australia, more sites feature hidden cables than ever. In addition to bringing your construction efforts to a halt, accidentally damaging cables can harm workers and have a negative impact on the nearby environment. It is essential and crucial to be using underground utility locating equipment on your next job.